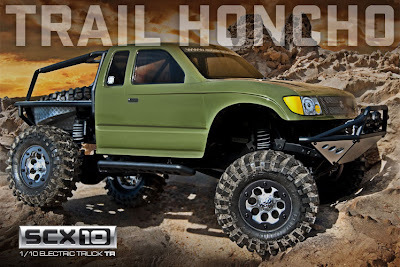 Axial is coming out with a new trail ready with the Honcho body (AX90016). The Axial Honcho Trail Ready is based off their popular SCX10 chassis and comes prebuilt in RTR form with everything except batteries and charger. The kit comes with lights, four white lights and two red lights, Pro-line tires, tube bumper, metal skid plates, and a spare tire are just a few of the features that comes with the RTR scale truck.